Well, it was a fun time at MSW. The weather was great, just a bit on the chilly side, but I was able to wear Poppy, so that was cool. I got many compliments. The haul is pictured, except for two glass buttons I bought, and a travel cup. 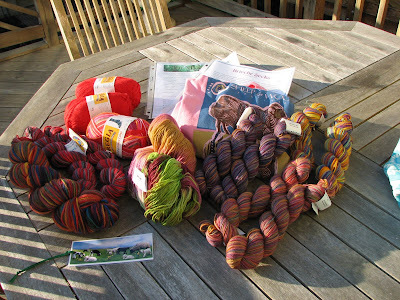 Starting at far left going clockwise: 1 skein Mountain Colors, 2 skeins of Claudia Handpainted sock yarn, 3 balls of Regia, 2 patterns from Blue Moon Fiber Arts (I think these are from previous sock club years), a festival T-shirt, 6 skeins of Koigu, and a skein of really nice merino from Autumn Farm. I love those colors. The red yarn is for some secret socks I’m going to make. I think I did pretty well. DH gave me money to spend in liu of Mother’s Day and our anniversary (May 8th) and I did add to it, but not a huge amount. One disappointment: I failed to find the Blogger meet-up. I looked, but didn’t find anyone. I did meet Amy O’Neill Houck, of Knitty Gritty fame, who lives in the DC area. She gave me some tips on potty training Amelia! Oh my goodness! Look at that haul. I love the Koigu – a lot. Oh, who am I kidding? I love it all!! Too bad you didn’t find the blogger meet up – but glad you still had a good time. Thanks for sharing your goodies with us! New to your blog . I came from jimenycrickets comments. Your koigu is wonderful!! I also like your Regia color choice. Can you share the name of the colorway? Take a peek at my blog re: koigu if you wish. I’m jealous you got the Blue Moon stuff! I managed to miss that. Ah well, next year.